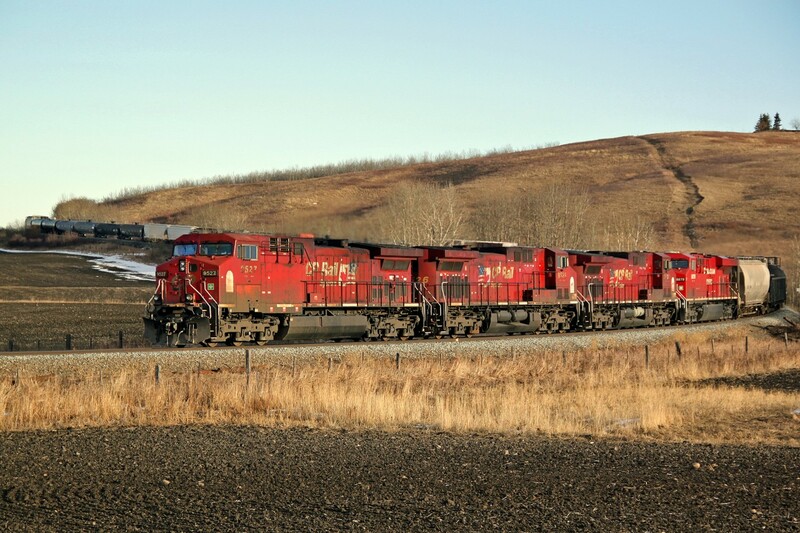 Railpictures.ca - colin arnot Photo: A trio of AC4400CWs, CP 9527, 9526 and 9529, plus ES44AC CP 8879 descend the hill from De Winton heading north on CP’s Aldersyde Sub. | Railpictures.ca – Canadian Railway Photography – photographie ferroviaire Canadienne. Caption: A trio of AC4400CWs, CP 9527, 9526 and 9529, plus ES44AC CP 8879 descend the hill from De Winton heading north on CP's Aldersyde Sub.